In this SharePoint 2016 tutorial, I will explain how to resolve Site content and structure missing in SharePoint 2016/2013 error. I will show how to enable content and structure in SharePoint 2013 or SharePoint 2016. Solve site content and structure SharePoint 2013/2016 missing issue. Resolve SharePoint online content and structure missing. 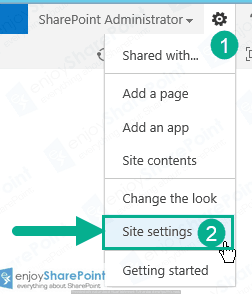 I want to move a few folders and subsites from one location of the site collection to another location in SharePoint 2016. I am not able to see “Content and structure” option in site setting to move a folder and site without any 3rd party tool. By using Site content and structure we can manage the whole content easily. Site content and structure will come with “SharePoint Server Publishing Infrastructure” feature. Follow the below steps to enable this feature to enable “Content and Structure” in SharePoint 2013 / 2016. 4. Once you activate this feature you will see this feature as part of site administration features. 5. Once you click on this option you will see as below. 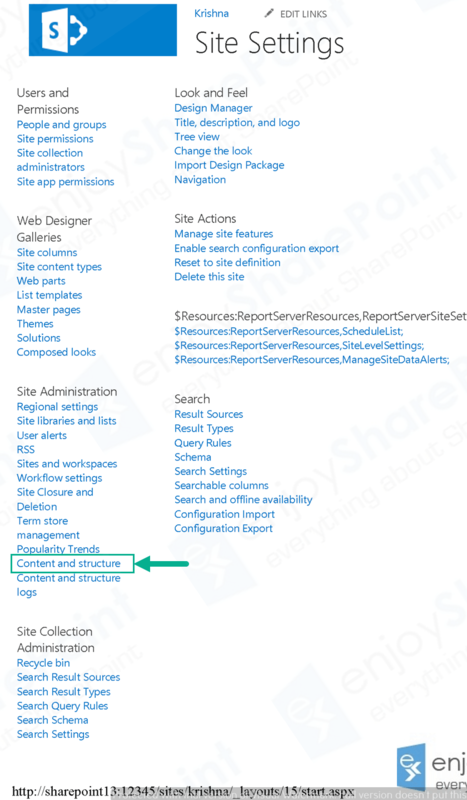 Hope this helps to solve SharePoint 2013/2016 site content and structure missing issue and how to enable content and structure in SharePoint 2013/2016.